As a precursor to their Bloody Women panel discussion tomorrow night, the ICA London asked the Twitter-verse to name our favorite horror ladies (mine: Barbara Steele, Dara Nicoladi, Karen Black), and it sparked thoughts on how the role of the women and even the “Final Girl”often directly manifests in artists’ work too. I’m just beginning research on the role of architecture in visual art stemming from a direct relationship to horror cinema (think of the aforementioned Simmons, Mike Nelson, etc). Amongst other structural functions such as spatiality and establishing a sense of unease within the familiar, the house/home in horror films challenges the forced and/or changing ideas of domesticity throughout the decades. 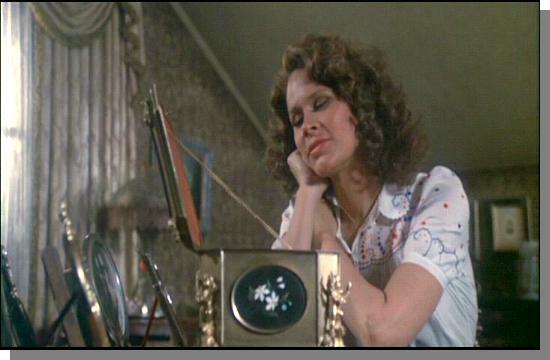 One example of this is also one of the films Simmons references, Burnt Offerings (1976) starring my horror heroine Karen Black. The movie is about a young family who takes care of a mysterious house one summer to escape the city however they wind up as literal house food. The house kills most of family, save Black’s character, who is gradually yet forcibly absorbed into the house becoming its official “mother” and caretaker. The film can be read as a reaction to second wave of feminism in the United States, a return back to traditional and fundamental women/mother/Victorian ideals. 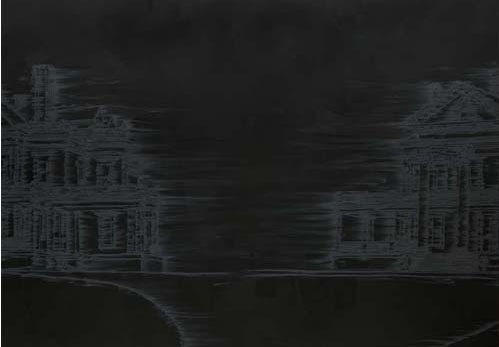 Simmon’s usage of the Burnt Offerings house facade reinforces the notion that we (i.e. the audience, viewer, or visitor) can never really judge a book by its cover; that what lurks behind the front door to an old house or behind the cinema screen curtain can be an unexpected yet real horror. His blurred reflection of the house establishes a visual tension that reminds us that physical and mental ‘interiors’ are infinitely complicated and that there can be a serious danger in the projected appearance of perfection.